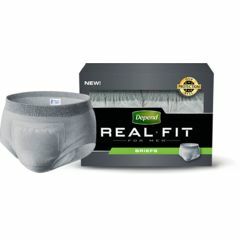 Depend Real Fit Briefs are the revolutionary new protective underwear for men that looks and feels just like real underwear.The cloth-like fabric provides underwear-like comfort. These discreet briefs for men provide maximum protection and worry free odor protection. The finished elastic waist band and all-around leg gather help provide additional security. Real Fit Briefs are perfect for daily wear. The discrete natural look provides protection and security that only you will know about. Made by Depend - a name you can trust in incontinence protection! My son is outgrowing his current disposable underwear and we have had a hard time finding a product that he is comfortable with. This particular Depends product is pretty good but I can still get it much cheaper at a local large retail chain and avoid shipping charges. Asked on Mar 12, 2015 8:07:16 PM by got to go from san diego ca. I wear brief size 36-38. If I order the depend briefs what size should I order. The new Real Fit Briefs for men really fit great and are so much better than the previous ones, but for people on fixed incomes why do they have to be so Expensive.